We’re in here talking about Little League baseball. I mean listen, we’re in here talking about Little League. Not the pros! Not the pros! Not the pros! Little League. We’re talking about Little League baseball. We’re talking about a bunch of 12-year-old kids who just want to play baseball. It’s not life-changing, it’s not world-altering, and it’s a blurb in the sports world in general. WHO THE HELL CARES. Yes, I understand there’s money involved. Yes, I understand there are the kids who lost to this team who feel the need to be vindicated. But in a society that has evolved to a place where last place teams get trophies, WHO THE HELL CARES. You want to eliminate scandal? Eliminate the paid positions of Little League. Make President, Secretary, and other league positions strictly volunteer. Eliminate territorial restrictions. If a kid’s parents are willing to drive three hours away three times a week so their kid can play ball, let them. WHO THE HELL CARES. Take the games off ESPN. It’s a bunch of kids, for crying out loud. Nobody cares that the third baseman’s favorite food is pizza or that his favorite car is whatever his dad drives. OF COURSE IT IS; the kid is 12 FREAKING YEARS OLD. WHO THE HELL CARES. Sports are supposed to be fun. Not everything needs to be treated as life-or-death, do-or-die. Let the kids play for the hell of it. Everybody plays every game. Kids need to learn how to have fun. Kids need to learn how to win graciously, how to lose classily, and more importantly, how to play as a team. Parents need to learn to cheer for success, to offer encouragement after failures, and more importantly, need to learn how to realize it’s just a GAME played by KIDS. LET KIDS BE KIDS. STOP CREATING CONTROVERSY WHERE THERE SHOULDN’T BE ANY. WHO THE HELL CARES. 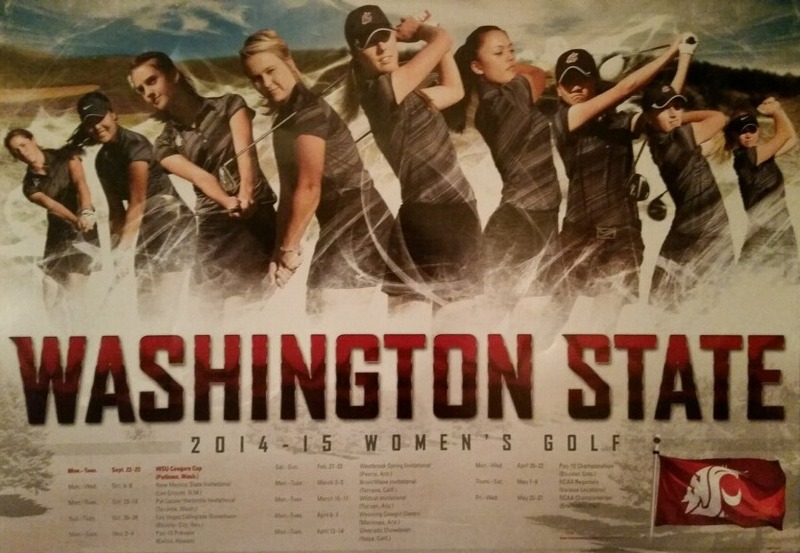 Washington State University’s women’s golf team tees off their spring season by traveling to Peoria, Arizona to compete in the Westbrook Spring Invitational on Feb. 21-23. Fifteen universities will be competing in the event, including Oregon and Oregon State from the Pac-12 conference. The remaining participating schools are College of Charleston, Illinois, Indiana State, Iowa, Kansas State, Nebraska, Notre Dame, Oklahoma, Ohio State, Tennessee, Tulsa and Wisconsin. The University of Wisconsin Badgers will be the hosts for the second consecutive year of the tournament. WSU will be looking to improve on their showing from last year. They finished tied for ninth place with Kansas State, 38 strokes behind winner Ohio State. The Cougars finished their fall season last November competing in the Pac-12 Preview where they placed eighth in the tournament, 39 strokes behind The University of Washington. The team consists of freshmen Alivia Brown, Jamie Midkiff, BreeLin Wanderscheid, sophomore Cherokee Kim, and juniors Monica Huang, Rachel Lewis and Nani Yanagi. Seniors Lindsay Harmon and Kristen Rue round out the roster. You know the names, the numbers. The Legion of Boom. Earl Thomas, Richard Sherman, Kam Chancellor. 29, 25, 31. The right corner and the nickelback positions have been much of a revolving door, thanks to injuries, retirement, suspensions, free agency. Marcus Trufant. Brandon Browner. Walter Thurmond. Antoine Winfield. Jeremy Lane. Marcus Burley. Byron Maxwell. Tharold Simon. The last four names played significant roles in the Super Bowl loss. Lane and Burley were victims of circumstances beyond their control. The latter two experienced two different games, with Maxwell playing a passable game, Simon merely passable on. Burley was ruled out before the game started, declared inactive by the Seahawks in an attempt to pare their 53-man roster down to the 46 active players the NFL requires for each game. Lane suffered a compound fracture in his left arm, which occurred when he was tackled during the runback of his first career interception. The injury knocked Lane out of the game and pushed Simon in, leaving Maxwell to man the slot receiver. The injury also left the Seahawks with Simon, Maxwell, and DeShawn Shead as the only healthy secondary players remaining available, as the much-ballyhooed trio of Sherman, Thomas and Chancellor were fighting through substantial injuries of their own. This was significant because of the personnel matchups that now gave an advantage to the Patriots. According to the Seahawks’ website, Maxwell measures in at 6-foot-1, 207 pounds; Simon at 6-foot-3, 202 pounds; and Shead at 6-foot-2, 220 pounds. Lane and Burley, meanwhile, checked in respectively at 6-foot, 200 pounds and 5-foot-11, 185 lbs. However, with these two out, the big, behemoth, physical corners were tasked with stopping the Patriots receivers who physically checked in generally much, much smaller. The Patriots active WRs were as follows: Danny Amendola measuring in at 5-foot-11, 195 pounds; Julian Edelman at 5-foot-10, 200 pounds; Brandon LaFell at 6-foot-3, 210 pounds; and Matthew Slater at 6-foot, 200 pounds. Slater didn’t play until the final two snaps of the game, which were two kneel downs to kill the clock. Shane Vereen, the Patriots’ “pass-catching” running back, measured at 5-foot-10, 200 pounds. These men caught 29 of Tom Brady’s 37 completions with the remaining eight passes caught by Rob Gronkowski (six) and one apiece by FB James Develin and TE Michael Hoomanawanui. Edelman especially abused Simon with his shiftiness, twice breaking wide-open with a ‘whirl route’ that left Simon grasping at air in a futile attempt to cover him. The first time Brady badly overthrew Edelman for an incompletion, but the second attempt was completed for what proved to be the game-winning touchdown pass. Simon is a thumper, but his body type doesn’t allow him to change directions as quickly. As a big man, his primary goal is to put his hands on the receivers and disrupt them before they can enter their route, to push them off their spot. Twice he was unable to do so, and the Seahawks paid the price. Much like Lane, Burley is a shiftier, slipperier, stickier cornerback whose game is predicated on speed and athleticism over physicality to play CB in the NFL. He filled in admirably for Lane early in the season and held his own over the course of the year, even recording his first interception against Carolina’s Cam Newton in Week 7. It isn’t difficult to imagine a different outcome if Lane and Burley were chasing around the Patriot receiving corps. If the reason behind the pass call on second-and-goal was the big picture as Coach Pete Carroll insists is the case, then I believe the reason that Simon was active for the game and Burley was not is simple: Simon is Maxwell’s replacement and the Seahawks wanted Simon to get experience under pressure. Maxwell is one of the best available corners in free agency. He’s healthy and entering the prime of his career at age 26, while other free agents include guys like Antonio Cromartie, Charles Tillman (old) or Ike Taylor and the ex-Seahawk Thurmond (injuries). Maxwell will be, in his own words, “the prettiest girl at the dance.” With the Seahawks having to soon address Bobby Wagner and Russell Wilson’s contracts, sacrifices must be made and it appears that Maxwell will be a casualty of the LOB, much like Browner and Thurmond before him. While the what-if scenarios are seemingly endless and the sting of the Super Bowl loss is raw, it is poignant to remember that the Seahawks have locked up the majority of their record-setting defense for the next 3-5 years. As the offense continues to build cohesion with each other and gain efficiency over the next few years, it will be a very, very exciting time for Seahawks fans.